We know that the humble thistle isn’t what people would normally consider a ‘typical’ wedding flower but this slighty spiky flower is proving to be a little more popular than you imagine! Our Sarah’s Flowers thistle has been unfortunately out of stock for the majority of the Summer season but these guys are now back in stock and are ready for you to purchase! We all know that a wedding is full of sensual colours and romantic textures – and they all result in feelings of love, something the thistle is not very well known for. With its sharp prickles that can appear over the stem and flat part of the leaves, a lot of people don’t see past it’s prickly nature, when in fact the thistle have the most beautiful flower head and colour schemes. Now before you all go out and scratching your hands by collecting some thistles for your own bouquet, how about you have a gander at the way we do thistles! This bouquet would look amazing with matching purple tones thistle buttonholes. This buttonhole with white heather and delicate crystals – this would also make for great memento for your guests too. 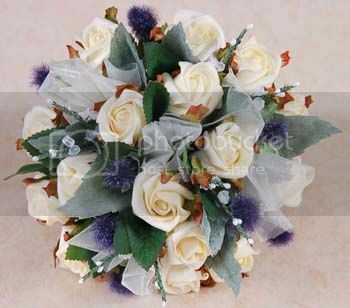 Going for the true Scottish style, this bouquet is just perfect. Along with the white heather and ivory organza, there is the addition of the thistle and mixed foliage of thistle leaves and green rose leaves. 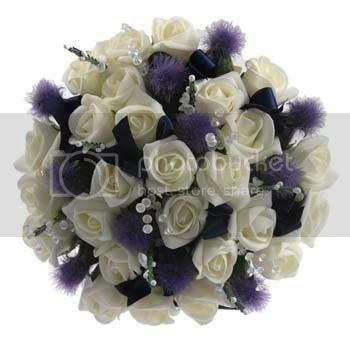 This bouquet would look just amazing for the more traditional Scottish wedding, or even for a natural feel wedding. 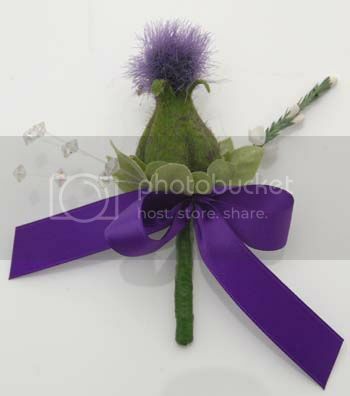 And don’t forget if you wish to include our soft thistle into any of your bouquet ideas then just get in touch. We offer a fully bespoke bouquet service to give you exactly what you want in your bouquet – no paying extra for flowers in season or for type of flower, we can help you get the bouquet of your dreams – go on we don`t bite, so why not get in contact with us. This entry was posted in Brides, Bridesmaids, General Interest, Grooms and tagged artificial, Artificial flowers, artificial wedding flowers, bespoke wedding bouquet, blue, blushing bride, Bouquet, bridesmaids posies, Bridesmaids Posy, delicate crystals, fake, faux, foam roses, heather, Ivory roses, natural wedding, purple, sarahs flowers, sarahsflowers, scottish, silk flowers, spiky, spray, Thistle, thistles, wedding day flowers, Wedding flowers.